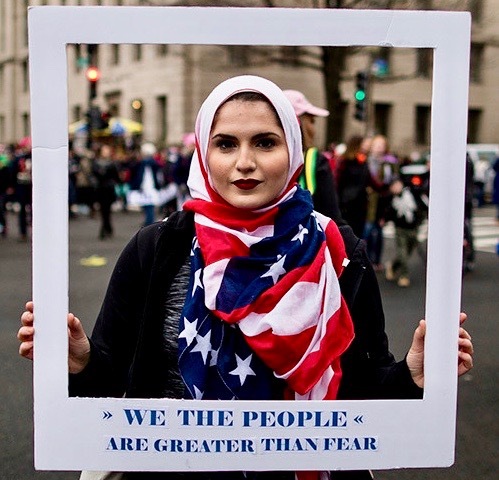 The United States has debated immigration since the country's founding, and the Statue of Liberty—a potent symbol for immigrants—is often invoked as an argument for why we should usher in those who seek safety and opportunity with open arms. 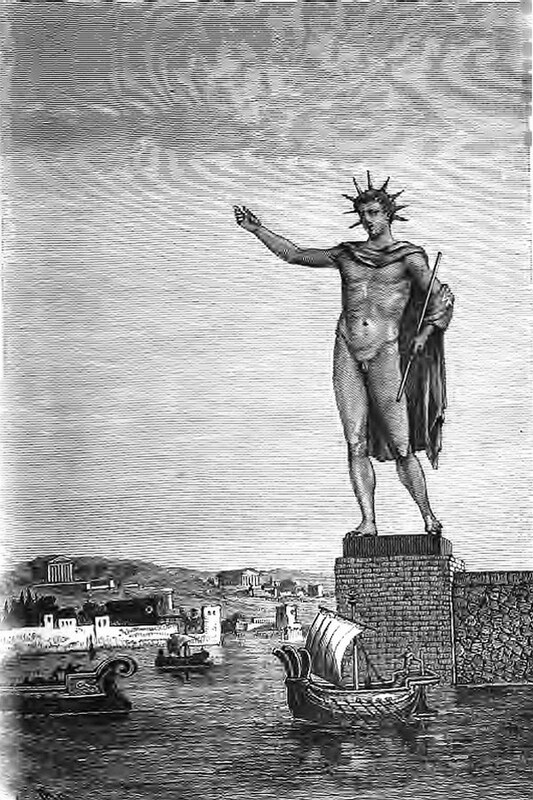 A little-known fact about Lady Liberty adds an intriguing twist to today's debate about refugees from the Muslim world: according to the Smithsonian Institute the statue itself was originally intended to represent a female Egyptian peasant as a Colossus of Rhodes for the Industrial Age. That might be surprising to people more familiar with the statue’s French roots than its Arab ones. 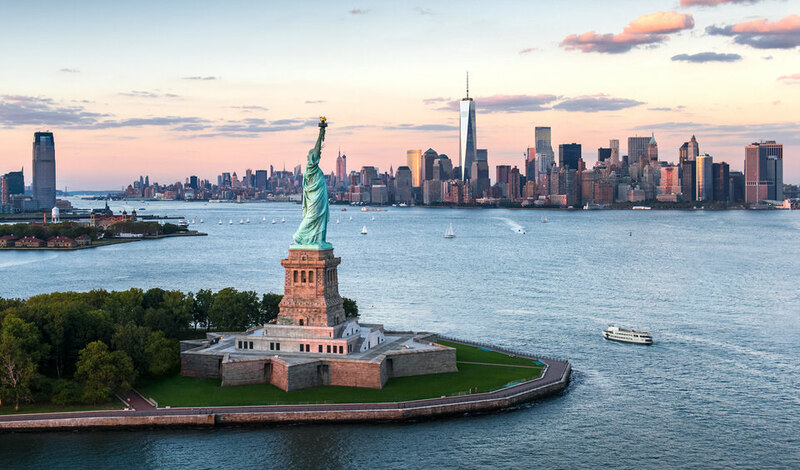 After all, the statue’s structure was designed by Alexandre-Gustave Eiffel (yes, that Eiffel), and Lady Liberty was given to the United States by France for its centennial to celebrate the alliance of the two countries formed during the French Revolution. The statue’s designer, Frédéric-Auguste Bartholdi, was also French, but he found inspiration in a very different place: Egypt. 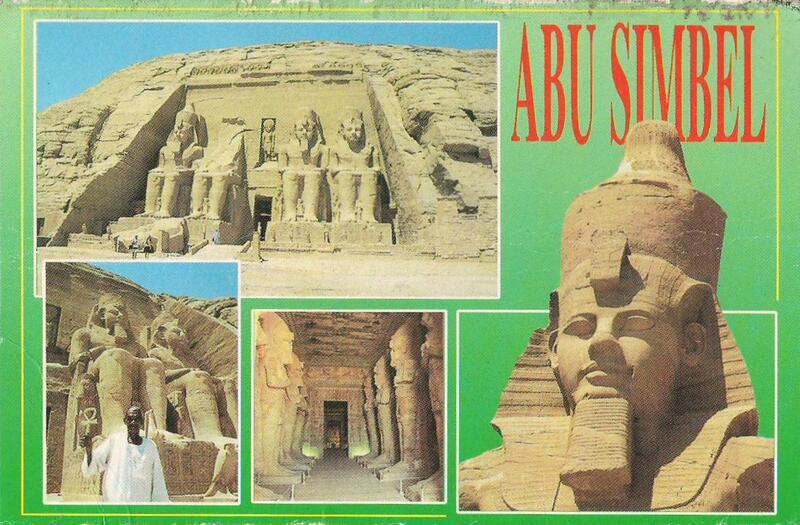 In 1855, Bartholdi visited Nubian monuments at Abu Simbel, which feature tombs guarded by gigantic colossus figures. Bartholdi became fascinated by the ancient architecture, developing what the National Park Service calls a “passion for large-scale public monuments and colossal structures.” Eventually, he channeled that passion into a proposal for the inauguration of the Suez Canal. Bartholdi envisioned a colossal monument featuring a robe-clad woman representing Egypt to stand at Port Said, the city at the northern terminus of the canal in Egypt. Edward Berenson, author of Statue of Liberty: A Translatlantic Story, writes that Bartholdi’s concept morphed from “a gigantic female fellah, or Arab peasant” into “a colossal goddess.” But Egypt, which had invested enormous amounts of time and money into the landmark canal, was not as eager about Bartholdi’s idea. Isma’il Pasha, the reigning khedive, rejected the plan as too costly. Eventually, a 180-foot tall lighthouse was installed at Port Said instead. But Bartholdi was not discouraged. 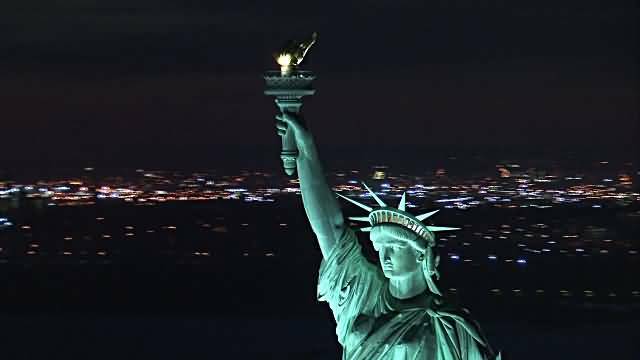 He eventually repurposed his concept into “Liberty Enlightening the World”—the official name for the statue that has been overlooking New York Harbor since 1886. Auguste Bartholdi was born on August 2, 1834 in Colmar, Alsace, France, Early in his career, Bartholdi extensively studied art, sculpture, and architecture. From 1855 to 1856, Bartholdi embarked on a life-changing trip throughout Europe and the Middle East with some fellow artists. 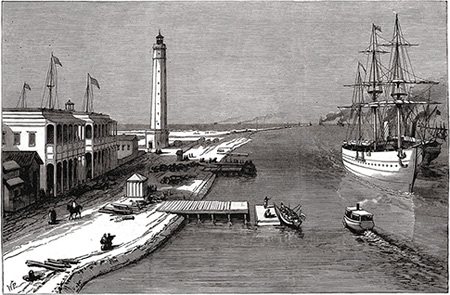 In 1869, the Egyptian government expressed interest in designing a lighthouse for the Suez Canal. Eager and excited, Bartholdi designed a colossal statue of a robed woman holding a torch, which he called Egypt (or Progress) Brings Light to Asia. When he attended the canal's inauguration, however, Bartholdi was informed that he would not be able to proceed with the lighthouse. Although disappointed, Bartholdi received a second chance to design a colossal statue. In 1865, Edouard de Laboulaye proposed that a monument representing freedom and democracy be created for the United States. 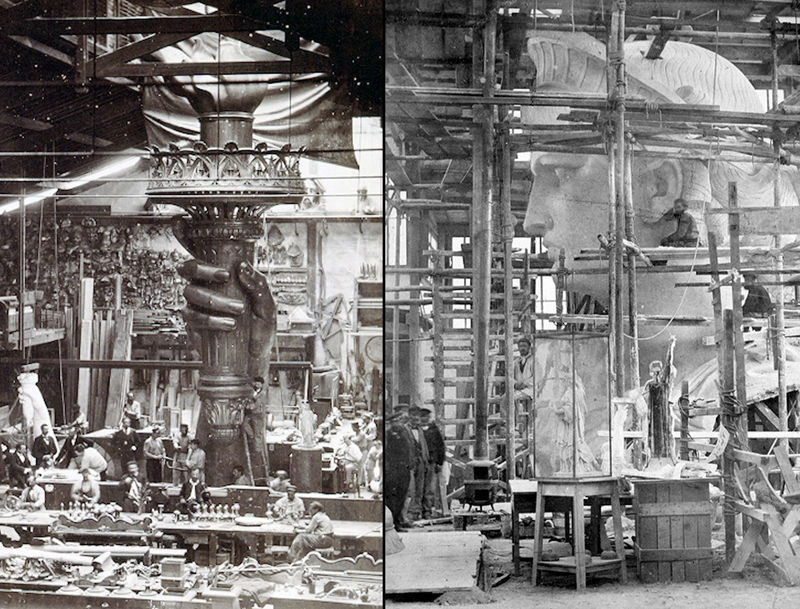 Bartholdi was a great supporter of Laboulaye's idea and in 1870 he began designing the Statue of "Liberty Enlightening the World." In the first few years after the Statue's conception, Bartholdi made a number of trips to the U.S. The moment he first entered New York harbor by ship, he spotted the location where he knew the Statue must stand - Bedloe's Island. 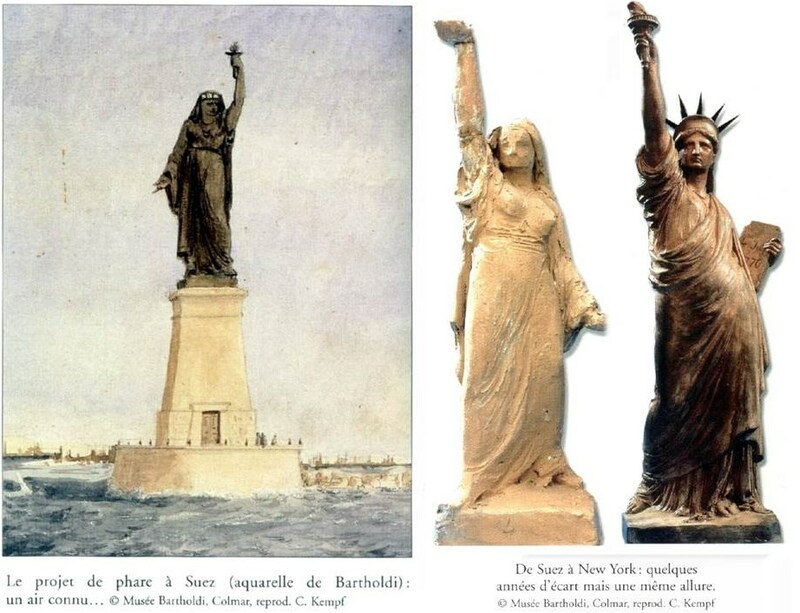 Bartholdi saw New York as the gateway to America and it was at Bedloe's Island that Bartholdi envisioned the Statue rising out of the star-shaped Fort Wood. Bartholdi also used his trips to stir up support for the Statue - both ideologically and financially. When he returned to Paris in 1872, Bartholdi used his American contacts to assist Edouard de Laboulaye in creating the Franco-American Union in Paris which raised 400,000 francs to fund the construction of the Statue. 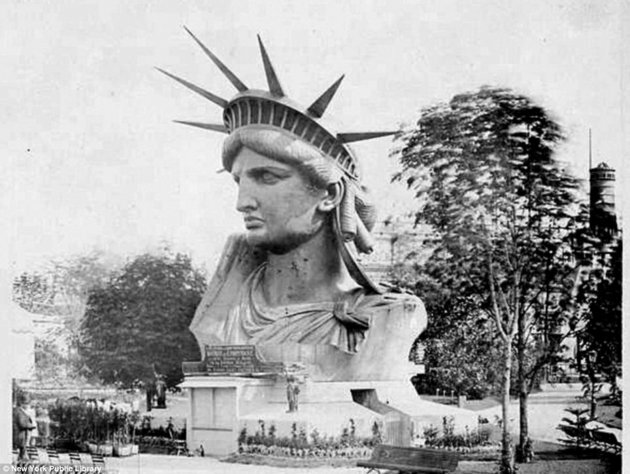 Bartholdi visited the United States once more in 1876 to display the Statue's massive arm and torch at the Centennial Exposition in Philadelphia. Afterwards the pieces were displayed in Madison Square Park, New York City until 1882 to assist in fundraising. 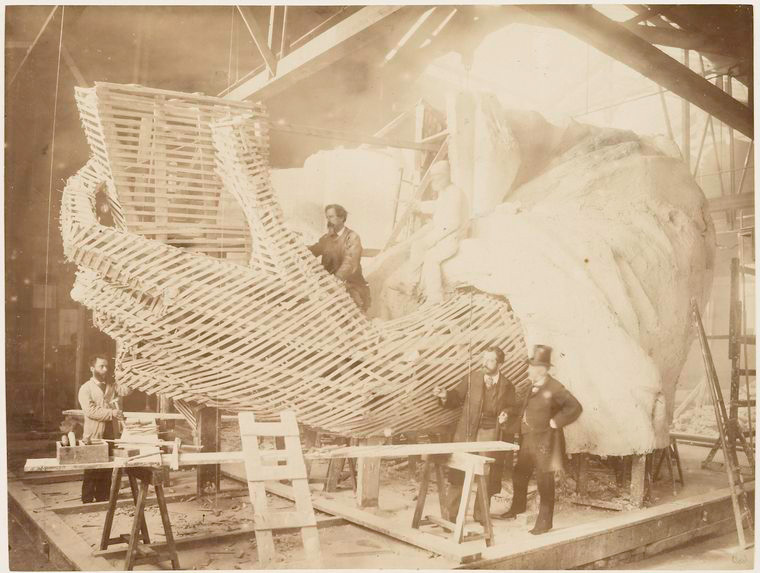 Additionally, Bartholdi assisted with setting up the American Committee for the Statue of Liberty for fundraising in the United States for the pedestal. The Statue was fully constructed in Paris and presented by the Franco American Union to the United States Ambassador in 1884. In 1886, Bartholdi oversaw the Statue's assembly in New York and participated in its inauguration. At the ceremony, Bartholdi was presented with the key to the city and later climbed the Statue to release the tricolor French flag that veiled Liberty's face. Bartholdi died of tuberculosis in 1904. Originally, the meaning of the monument had more to do with the abolition of slavery than with immigration. In the 1860s, French anti-slavery activist Edouard de Laboulaye had first proposed that France should make a gift of the statue, dubbed "Liberty Enlightening the World" and designed by sculptor Frédéric Auguste Bartholdi, both to commemorate the alliance between the U.S. and France during the American Revolution and the end of slavery in the U.S. after the Civil War, according to the National Park Service. But, while the statue herself would be a gift, it would be up to Americans to raise money to construct the monument's base. Many years passed during this period, and in that time the main liberty-related questions on Americans' minds — especially in New York City — evolved. The Civil War had ended, but a "Great Wave of Immigration" had begun, as 23.5 million persons immigrated between 1880 and 1920. 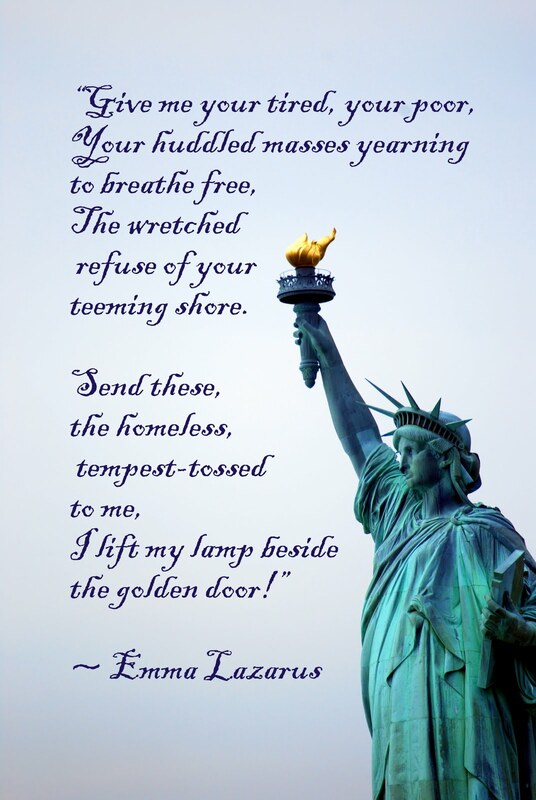 "Give me your tired, your poor," it famously declares, "Your huddled masses yearning to breathe free." Word about the poem got out, and it was reprinted in newspapers Joseph Pulitzer's New York World and in the New York Times. It became even more popular more than a decade after Lazarus' 1887 death, when her friend Georgina Schuyler happened upon a copy of the poem in 1901 and was moved to bring it new attention. She started a campaign to raise awareness of the poem timeliness. 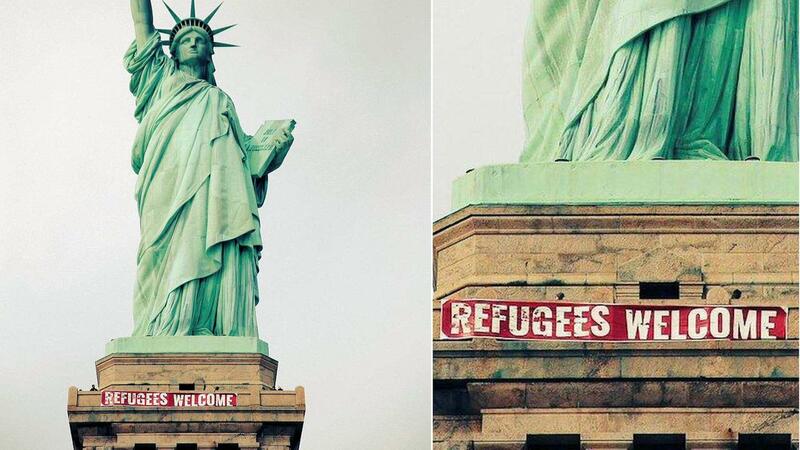 Its text was added to Lady Liberty's pedestal two years later, as the wave of immigration continued. 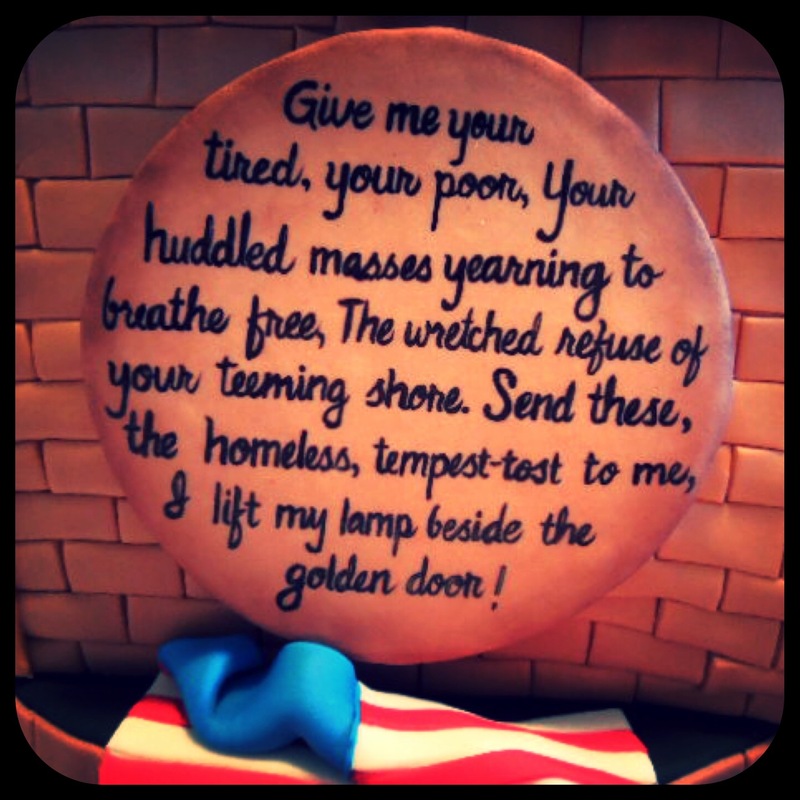 In the years since, though the statue would take on many additional layers of meaning, the link between it and immigration would solidify, with many recognizing that — even if Laboulaye had had something else in mind — Lady Liberty and Emma Lazarus were important parts of the history of immigration in the U.S. For example, when President Lyndon B. Johnson signed the Immigration and Nationality Act of 1965, it was in a ceremony on Liberty Island. 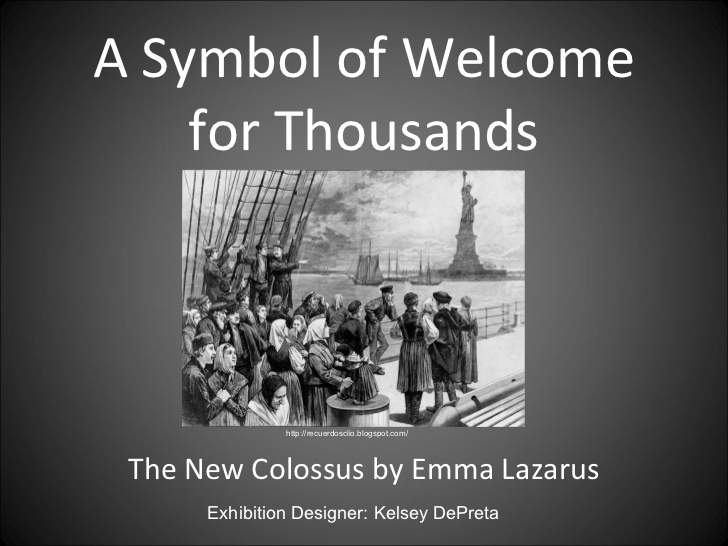 As Esther Schor, who wrote a biography on the author, said in 2011, “Emma Lazarus was the first American to make any sense of this statue."